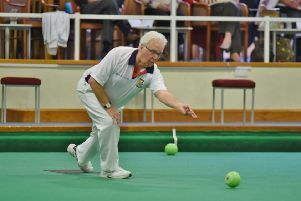 Nicky Brett’s dreams of retaining the Just World indoor singles title turned into something of a nightmare in today’s (January 27) quarter-finals at the Potters Resort in Norfolk. The world number one crashed out 10-5, 10-2 to Scotland’s ninth seed Stewart Anderson, a former winner of the title who on his own admission said it was his best ever performance on the portable rink. Anderson produced a superb exhibition of drawing bowls to which Brett had no answer as he was forced to chase shots end after end with the Scot regularly crowding the jack with pinpoint accuracy. Brett had to admit afterwards that he was very much second best on the day: “Stewart played great. He controlled most heads with his drawing bowls and I was forced to chase the game from almost the first end.